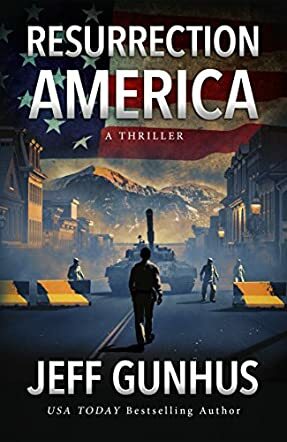 Resurrection America by Jeff Gunhus is an awesome, action packed thriller. I was hooked after the first page. Resurrection is a small town. Rick Johnson is a small town sheriff. He is a hard headed, common sense, combat veteran, who also is a very smart and conscientious cop. He is my kind of guy. His world changes one morning with one strange radio transmission from his deputy and this is the beginning of an amazing roller coaster ride of a thriller. Resurrection America doesn't start with a big bang. It starts with a spot on look at policing in small town America. The first scene is actually a little comical. The sheriff’s morning ablutions are interrupted by a frightened deputy. This scene is written very well and sets the tone for the rest of the novel. The action and tension grow until you can hardly stand it, before exploding into a satisfying conclusion. This is how good Jeff Gunhus is. I kept thinking that Resurrection America might have been written by Stephen King. The portrayal of ordinary life in America was just that spot on. The plot is brilliant. The portrayal of a Marine veteran who has kept his professionalism, even though he is working law enforcement now instead of running combat patrols, is perfect. A lot of the reason I like Resurrection America so much is because I like Sheriff Rick Johnson. We could be friends sharing war stories in a bar somewhere. He was that real to me. A great thriller all round. Wonderful book! The reviewer on top says it all. Be sure to read it. You will not be disappointed.